Swimming with Whale Sharks & Manta Rays ticks the top on bucket list of many visitors in the Maldives. 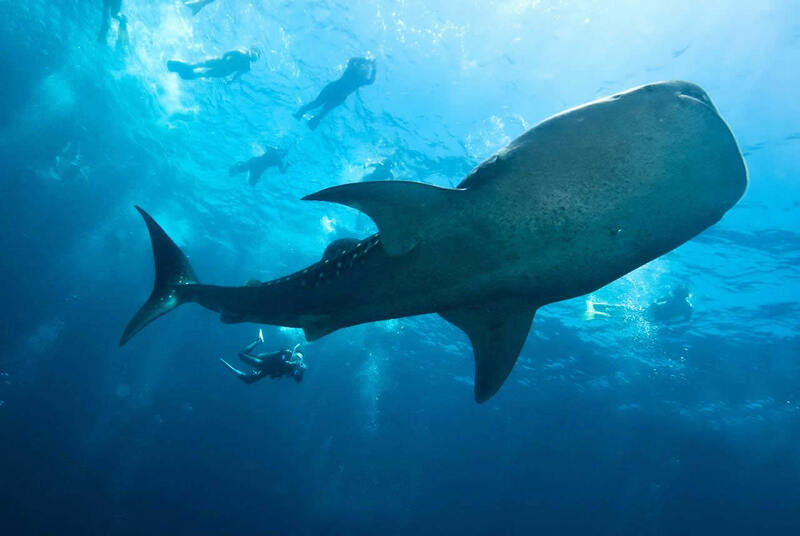 Being one of the biggest fishes in the ocean and one of the most majestic creatures to see underwater, snorkeling or diving with these gentle giants is one of the ultimate experiences. 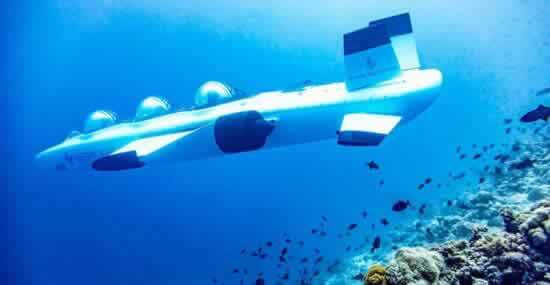 Fortunately the Maldives is a breathtaking destination for sightings of whale sharks and manta rays. However, good to know where and when to watch them. For pelagics lovers, from November until April a higher number of whale sharks and manta rays can be spotted on the western side of the Maldive atolls. While from May to October they feed on the eastern side of the atolls, due to the high plankton concentration. 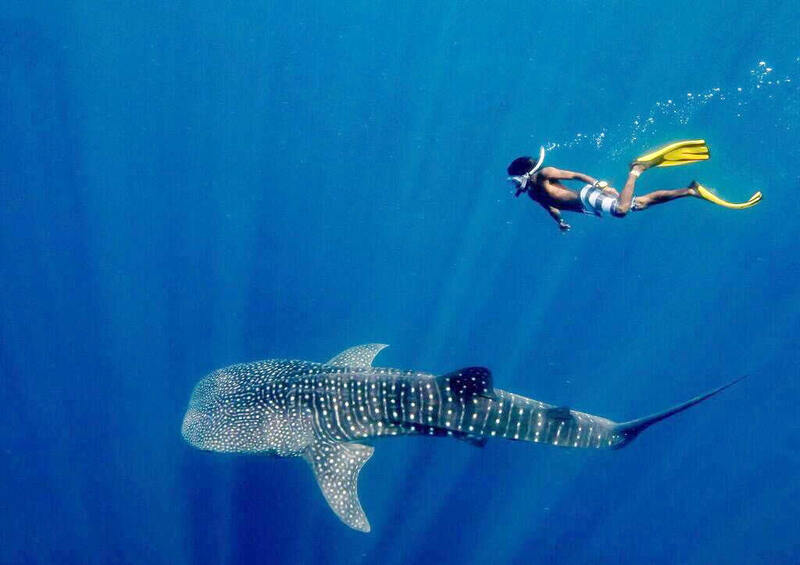 South Ari (Alifu Dhaalu) Atoll is one of the best places to spot whale sharks. The sightings are excellent year-round with a peak time from August to November. As for season, the best time is from December to May, even better from January - April. You may also spot manta rays in South Ari during the northeast monsoon from September/October to May (the peak viewing time is February - April). Another outstanding place to swim with whale sharks and up to 200 mantas feeding is the UNESCO World Biosphere Reserve in Hanifaru Bay, Baa Atoll. 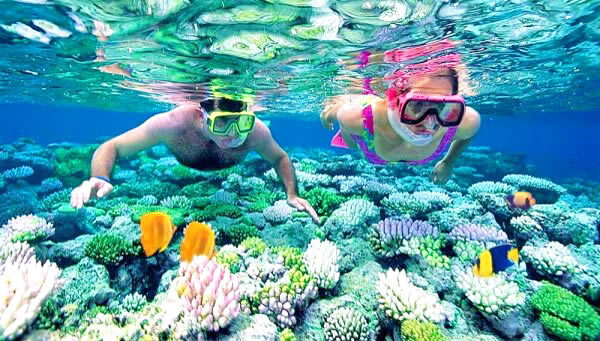 Diving is not allowed in Hanifaru Bay - only snorkeling! The best time for sightings here is between May and November. The following are the 10 best whale shark amd manta rays locations in the Maldives along with an indication of what is the best time to go. 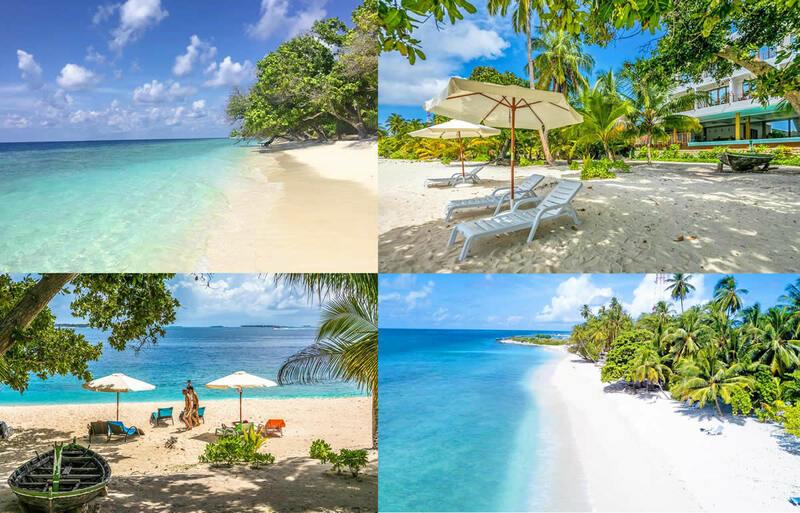 LUX Resorts & Hotels has introduced new developments for LUX * South Ari Atoll after its reopening in late 2016. 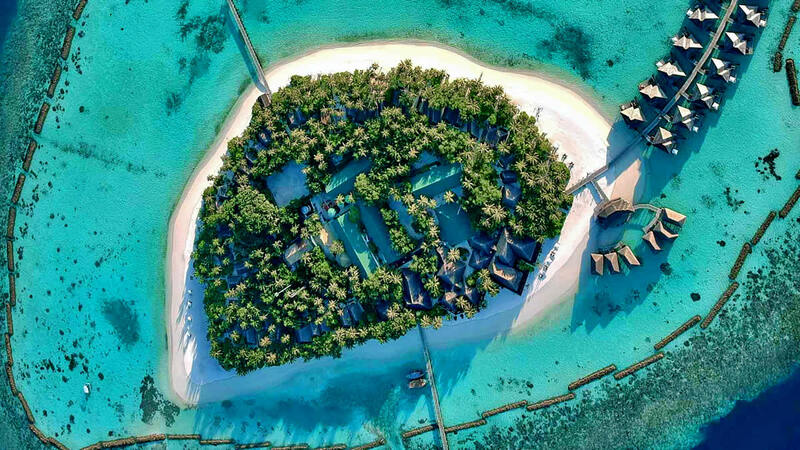 Cutting-edge designer villas and world-class dining can be found only a 30-minute seaplane flight away from Malé International Airport, making LUX* South Ari Atoll one of the most exciting resorts in the Maldives. With 187 private villas dotted at the water's edge along four kilometres of powder fine beach or perched on stilts above a crystal clear lagoon, these spacious pavilions and villas bring an entirely original vibe of coastal, beach house chic to the Maldives. Excellent eating and drinking is always a cut above the rest at LUX*, and at LUX* South Ari Atoll, there is authentic South East Asian street food in the Maldives' only over-the-water gourmet night market and world-class Chinese cuisine at East, along with the Japanese restaurant Umami, which offers live teppanyaki and dazzling selection of sakés. While the resort has a PADI-certified dive centre, two infinity pools, a floodlit tennis court, a fitness centre and a renowned spa. 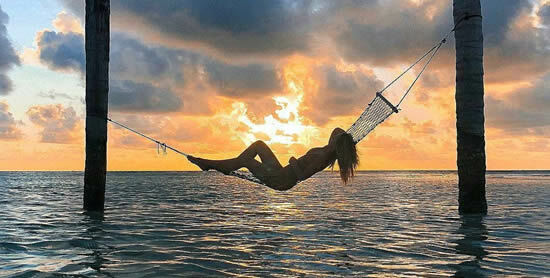 Sun Island Resort And Spa is located in luxurious surroundings of South Ari Atoll. With a relatively large island and a long list of dining and recreational facilities, Sun Island Resort is ideal for active groups on a budget, but probably less than ideal for honeymoons or those in search of a secluded romantic holiday. The 462-room resort is the largest in the Maldives. It's also among the cheapest, especially for the overwater rooms, so if price is a major factor then this resort offers good value. There are five bars, a 24-hour coffee shop, and five restaurants, including three specialty dining spots on the island. Meal and drink plans are available, though they have many restrictions. Catering to many large tour groups and families, the all-inclusive plans here are the most popular. There are also tons of land and water activities, a PADI dive shop, kid-friendly facilities, a massive pool, and lovely spa. Beach areas are perfect for shallow snorkeling and sunbathing. With one of the best house reefs in the Maldives, the great strengths of Vilamendhoo have always been snorkeling and diving, and affordable accommodation. Located in South Ari Atoll and accessible by a scenic 25-minute seaplane transfer, Vilamendhoo is surrounded by a beautiful lagoon, an excellent house reef and long stretches of white, sandy beach. The resort offers accommodation in 184 rooms, including 30 Jacuzzi Water Villas, 30 Jacuzzi Beach Villas, 111 Beach Villas and 13 Garden Rooms. The resort boasts several swimming pools, restaurants, as well as sports fields, a spa (and much more) scattered throughout the island which is divided into the family and "adults only" areas. With a magnificent house reef and All Inclusive offering - ​​it's a romantic, quiet choice for families and couples alike. With a great house reef snorkeling and beautiful beaches, Vakarufalhi Island Resort, better known as Vakaru is the ideal place for couples looking for an open space with the atmosphere of a private club in the Maldives. Today, the resort has gradually grown from a predominantly German diving island to a prestigious Italian resort under new ownership and management. The island itself still boasts of tall palms and natural vegetation, straw decorates every roof and sand everywhere in public areas. 4 *-star resort with 75 rooms has all the usual functions from spa and fitness, to diving and board games, although its only restaurant is a low-priced buffet, and the island does not have a pool and a public beach. 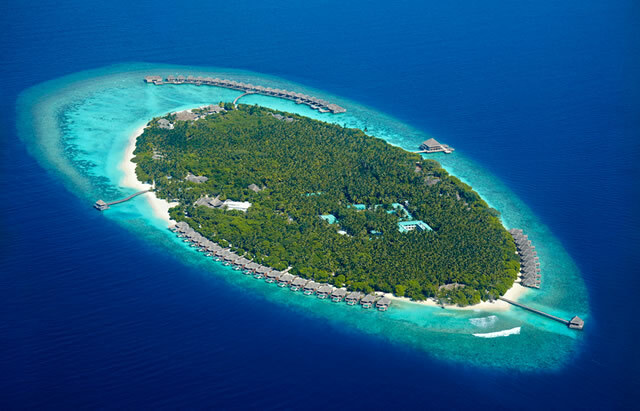 Located on Mudhdhoo Island in Baa Atoll — the Maldives’ first ever UNESCO biosphere reserve — Dusit Thani Maldives blends gracious Thai hospitality with the unparalleled luxury setting of the Maldives. 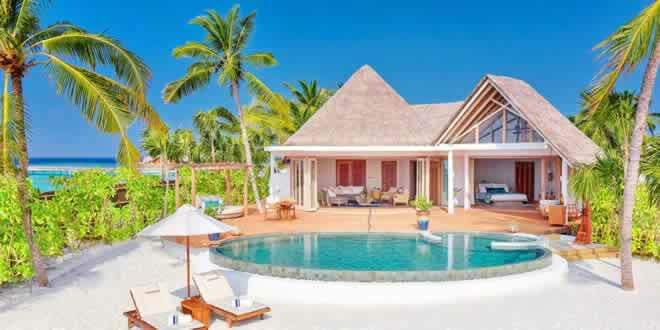 This luxury island resort comprises 94 villas encircled by white sandy beaches, a stunning 360 degree house reef and a turquoise lagoon. The resort’s guests prime access to experience this incredible sight just a 25-minute speedboat ride away from Dharawandhoo domestic airport. 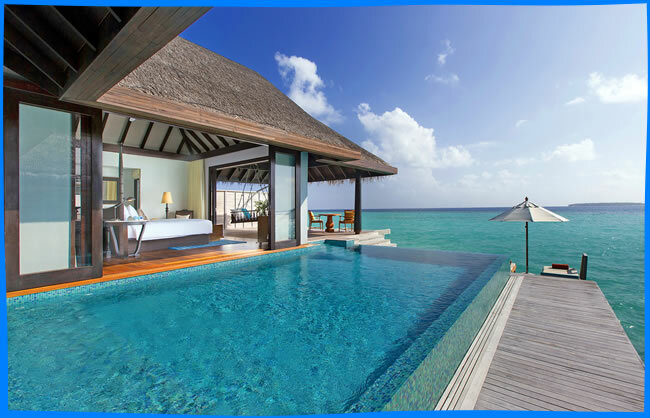 The resort offers a 360 degree vibrant house reef compliment with a turquoise lagoon, a 750-square metre infinity swimming pool with a lush Banyan tree in the centre, five restaurants and bars with breathtaking views and a Kids Club that is committed to making children’s dreams come true. 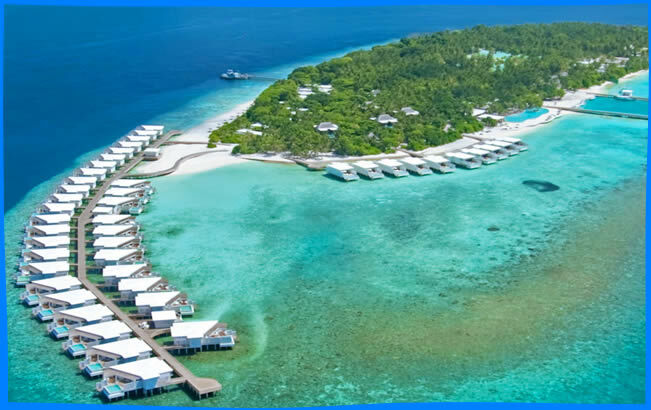 Located just 30 minutes by seaplane from Malé International Airport, Amilla Fushi offers a choice of 59 Houses that sit gracefully over crystal clear waters, nestled amongst lush tree tops or hugging the shores of pristine white sand. Amilla’s innovative restaurants range from the diverse, informal foodie hub Baazaar to the relaxed yet sophisticated overwater dining at the signature Feeling Koi. Guests can even drop in to gourmet café and deli The Emperor General Store or The Wine Shop and Cellar Door to treat themselves to lighter snacks, a favourite bottle or a gourmet selection of artisanal cheeses. With an unrivalled range of purpose-designed multi-bedroom accommodation options, and an exciting, inspiring and active Kids’ Club, Amilla Fushi is putting the Maldives on the map as a destination not just for couples, but for families and friends. 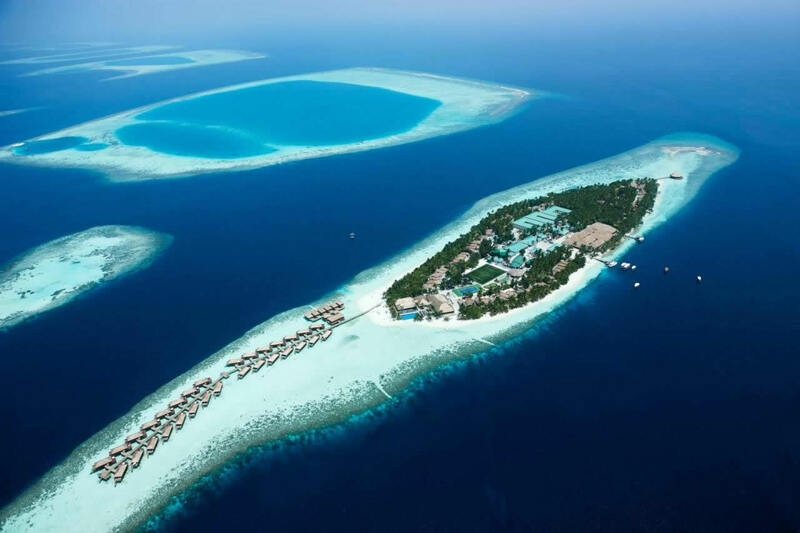 Discover Anantara Kihavah, a boutique hotel with all the advantages of a paradise island of dreams you can imagine - white beaches with fringed palm trees, turquoise waters, dedicated butlers, fine dining and luxurious Over Water Villas - and you will not be disappointed. 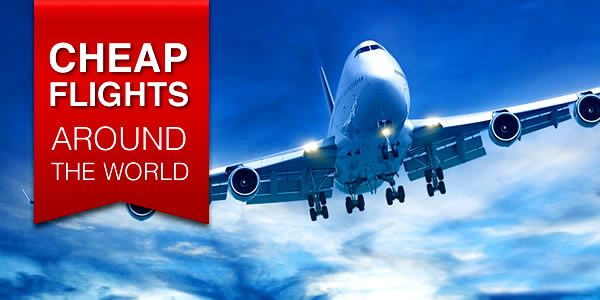 Anantara Kihavah Villas is just 35 minutes by seaplane from the Velana International Airport. Following the scenic flight, guests arrive to a picture-perfect setting surrounded by the jewel-coloured waters and uninhabited islands of the majestic Indian Ocean. Comprising 74 one-bedroom villas, four two-bedroom residences and a three-bedroom residence, each hideaway boasts large personal infinity-edge pools, dining pavilions, expansive wooden sundecks and ample lounging areas complete with swinging daybeds, hammocks and sun loungers. The affordable beach experience in Dharavandhoo Island will surpass all your expectations; the main theme in this part of the Maldives is not to miss the spectacular water adventures, where each excursion will be filled with new vivid impressions. Result? An unforgettable journey and memories that will remain with you forever. Easily accessible by domestic flight from Malé Airport, the beautiful Dharavandhoo is located in the heart of UNESCO's only marine biosphere reserve in the Maldives and is ideal for everything that Maldives has to offer. Maamigili, also known as 'Whale Shark Island' is an inhabited island and the only airport in South Ari (Alif Dhaal) Atoll. 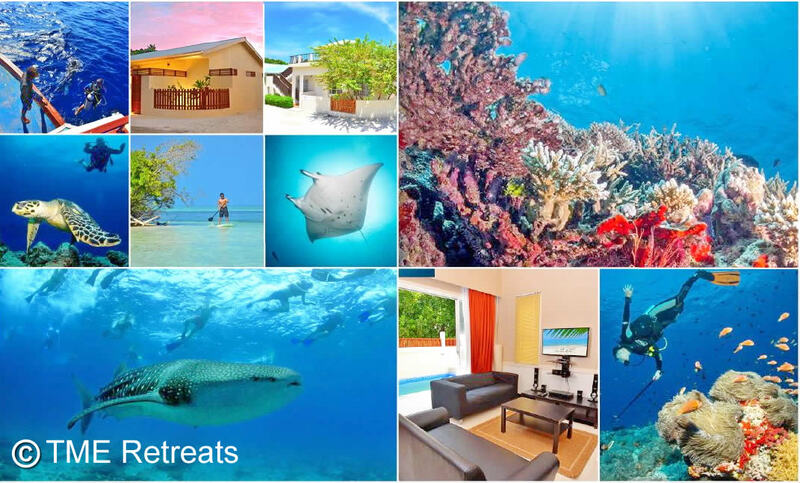 There are a few guesthouses, and it's a popular base for divers, who especially love staying here for the easy access to Dhidhdhoo Beyru with its whale sharks. 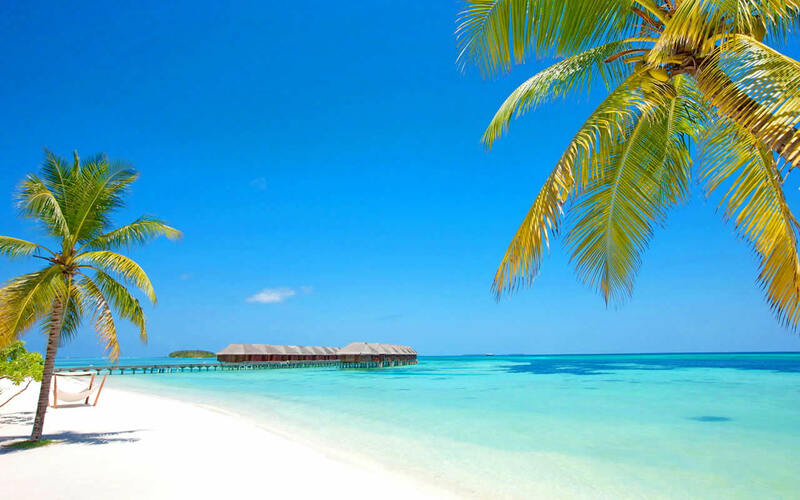 Maamigili is also the perfect choice for the traveler who wants something more than a resort, a genuine connection with the culture and a budget friendly experience of the otherwise pretty expensive Maldives. The famous whale shark area in South Ari Atoll, Dhigurah is a long Maldivian island with stretch of white sandy beaches. Heaven for fans of underwater adventures, Dhigurah island is 20-minutes by domestic flight or 1.5 hour speed-boat ride from Malé airport. 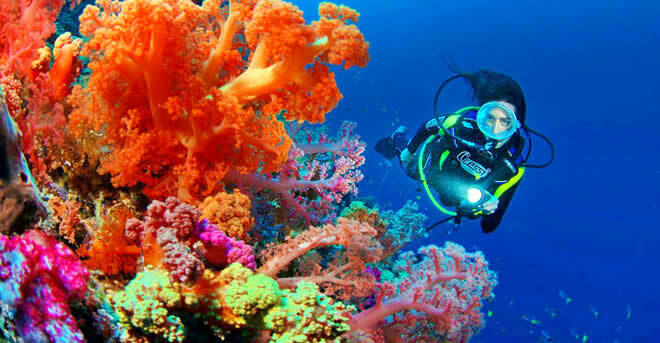 The island is a popular destination not only for fans of beach vacation, but also for divers and snorkelers who seek contact with whale sharks, manta rays and world-class corals that make this destination one of the best diving in the Maldives.